«Tonight» - see this page for tracklisting, lyrics, and a review. To download WMA snippets (duration 1 min 20 sec each) of the tracks go to the site for record details at www.azuli.com. What happens when you get dance music's most successful female artist ever, in the studio with dance music's coolest producers? Well there was strong possibility that the biggest party ever was going to take place, but luckily for music lovers everywhere, the result was the biggest summer anthem you're going to hear this year! «Tonight» is a piano-laden slice of summertime that looks set to smash the dancefloors from the UK to Ibiza, with a visit to the charts along the way looking very likely! The funky bassline and swinging percussion make you suspect that you're in the hands of some skilled producers here - a suspicion duly confirmed when the first piano chords drop in and you feel the hairs on the back of your neck stand to attention! 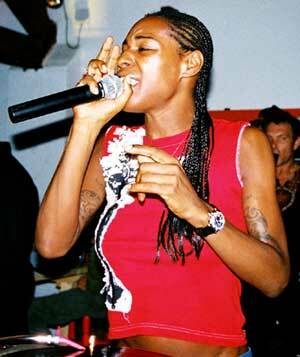 All this before we even hear the voice of Sonique that's topped the charts from the USA to the UK. «Tonight» stands in one row with great 1990ies House anthems sung by the likes of Adeva, Shawn Christopher or Ce Ce Peniston. All you need to know is that Sonique is back and better than ever on this record. Teaming her up with Haji & Emanuel was a masterstroke by Azuli label boss David Piccioni and we can all enjoy the results - vocal hooks you can't get out of your head, delivered with passion and emotion, all set to fire up the dancefloors. Big Love label boss Seamus Haji and Paul Emmanuel are one of the UK's hottest production duos and everything they touch seems to turn to gold. Haji & Emmanuel have had huge success with many tracks including «Last Night A DJ Saved My Life», «Weekend», «Take Me Away» and their 2005 remake of the classic we all know and love, Afro Medusa's «Pasilda». 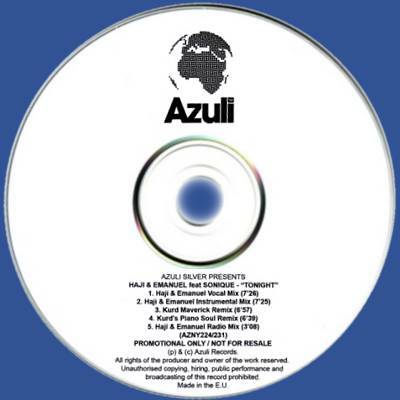 Azuli knows how to put out a good record, they've been doing it for 13 years! So no surprises that the second vinyl disk includes remixes of the highest quality from über-cool producer Kurd Maverick, who delivers a darker, electro-tinged sound on one remix, followed by a more uplifting Piano Soul Remix that will satisfy the most discerning of clubbers. 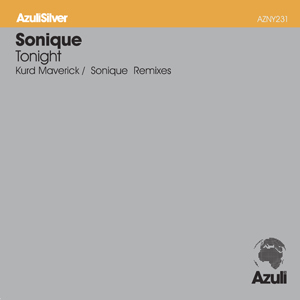 As well as a fantastically different remix from Sonique herself. In November 2006, another 12"
the French Market (Cat. No. including a new mix by Elio Riso. 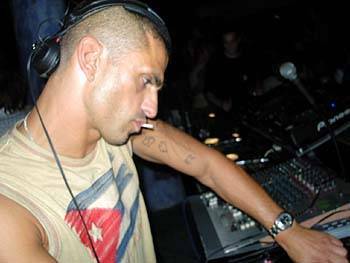 A five minute lasting version of the original Haji & Emanuel mix is also included on Azuli's most anticipated compilation of the year 2006 - «Space Ibiza 2006». Label boss David Piccioni has packed the best contemporary selection of big club tracks for the summer in a mix on two discs. A limited edition free DVD featuring a documentary on the history of the club and the white island is available with this double CD package. image, tracklisting and a review. 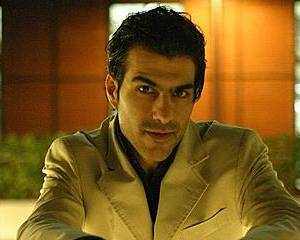 The Kurd Maverick Remix of «Tonight» you can find on the second release for the year 2006 of the «Club Azuli - The Future Sound of the Dance Underground» series. 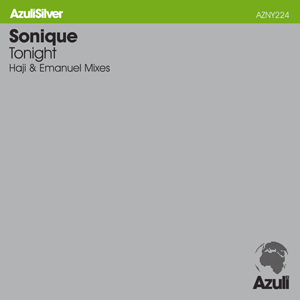 There are two versions of this double CD package around, an unmixed DJ friendly format and one for the main public, where the tracks are put into a non-stop mix on each disc. 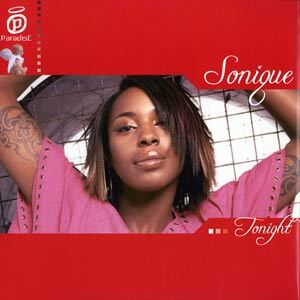 The lyrics of «Tonight» are rendered from the record (used track: Haji & Emanuel Radio Mix) and are hard to understand sometimes, so some errors still may occur on this page. For any correction of the lyrics contact the webmaster.